Nice, looking forward to using them, keep up the good work. 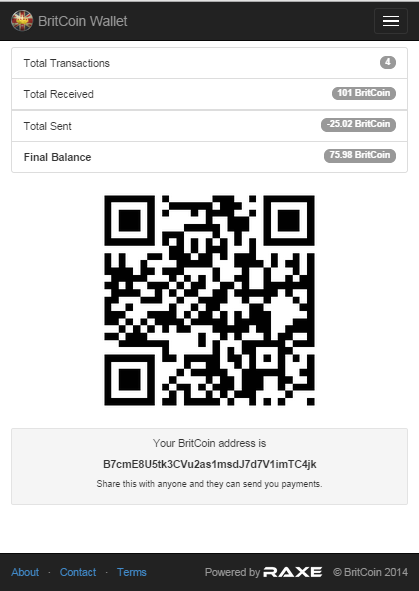 Here's a sneak preview of our new web/mobile wallet. We have decided to make some late changes to improve the functionality, so it will be released some point this week. Looking good, take your time and get it right Will. That IOS wallet looks awesome! I think it's the android app. My bad. Still looks really good though! Wait till we get our private send, web wallet and smart phone app, with only 10.8M coins in circulation watch the value take a sharp turn! We will release an iOS wallet in the near future, it may be a few weeks or even months, but for now iPhone users can use their web wallet from their iPhone to send/recieve.. Well they will be able to in a few days when it's live. Unfortunately the depth chart at Bittrex is misleading because bots fill the sell side with rubbish small orders in between the gaps to make the 'buys/sells' circle & depth chart look wrong. The chart only takes into consideration the orders you can see in the order book and not any which are there but 'off screen'. Either way the support is actually growing, and the word seems to be spreading. Excited by developments, so thanks as ever. Looks like we just hit an all time high! Well done to everyone, remember to hold and spread the word about BritCoin. This coin is still seriously undervalued. I think I understand what you mean. And although being a currency specifically for British business and individuals is quite a unique selling point, we are planning/working on things that will make BritCoin stand out from the crowd. Our BritCoin marketplace is set to be released tomorrow (so we hope) and we're looking in to a BritCoin sports betting platform. As always, patience is key, good things come to those who wait.